For fifty years, NASA's Kennedy Space Center in Florida has been the launch point for a generation of space technology and exploration. Countless enthusiasts (including this one) grew up longing to see a space shuttle up close and walk in the paths of astronauts. Today, a collaboration between NASA and Street View is enabling people around the world to take a trip to the doorway to outer space, and see Kennedy as it transitions into a multipurpose launch complex for the next 50 years of space innovation. This location is our largest special collection of Street View imagery to date, totaling 6,000 panoramic views of the facilities, and expanding our mission to document the world’s most amazing places. Among the images you can now explore online with the click of your mouse are the space shuttle launch pad, Vehicle Assembly Building and Launch Firing Room #4. Gaze down from the top of the enormous launch pad, peer up at the towering ceiling of the Vehicle Assembly Building (taller than the Statue of Liberty) and get up close to one of the space shuttle’s main engines, which is powerful enough to generate 400,000 lbs of thrust. From these vantage points, anyone can live out his or her childhood dream of becoming an astronaut. Even though they recently entered retirement, you can still get an up-close, immersive experience with two of the Space Shuttle Orbiters—the Atlantis and Endeavour —with Street View. We’d like to thank NASA for making this project possible and giving all of us the chance to digitally walk in the shoes of all of the pioneering astronauts, scientists, engineers and technicians that made our space dreams possible. 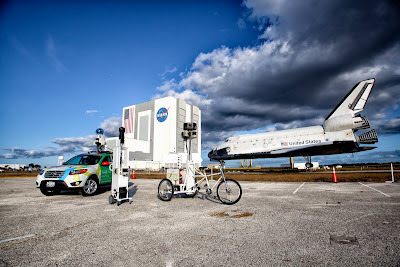 To explore more of our largest special collection yet, visit our Street View gallery at maps.google.com/nasa.